If you look at the “flagship” full-sized headphones currently on the market, you’ll notice they all share one particular trait: Whether they’re planars, dynamics, or hybrids, whether they cost $400 or $4000, they’re all open-backed designs. As long as you’re listening in a quiet environment and have no problem with other people hearing what you’re listening to, open-backed designs are superior. But what if you’re in a noisy spot or someplace where your music might distract others? In such situations an open-backed design may not be a practical option. Unless you can switch to in-ear monitors or have a pair of closed-enclosure headphones readily available, you may find your only civil choice is silence. So far, the goal of creating a closed-back, full-sized headphone that doesn’t have serious sonic drawbacks compared to a similar open-backed version has eluded most headphone designers. Some attempts, such as the Audeze EL-8C, have come very close to the sound of open-backed designs (in Audeze’s case, the EL-8), but have not quite equaled them. Enter the MrSpeakers Ether C ($1499–$1549, depending on cable length) headphones. Their sole reason for existence is to duplicate as closely as possible the sound of MrSpeakers’ open-enclosure Ether ($1499–$1549) so that end-users can listen to music in places where the open-backed design would be inappropriate. The big questions are: 1) how close does the Ether C’s sound come to that of the Ether, and 2) how close does the Ether C’s sound come to that of the best flagship open-enclosure headphones? I’ll attempt to answer both questions in this review. The Ether headphone series is MrSpeakers’ first design not based on a modified Fostex driver. Instead, the Ether headphones use a proprietary 69mm by 44mm V-Planar driver, which has a pleated surface that Dan Clark, MrSpeakers’ chief engineer, claims “can reduce distortion, improve transient response, and extend frequency range.” Bruce Thigpen originally developed this pleated driver for his Eminent Technology planar loudspeakers, and he is listed as the co-inventor on MrSpeakers’ pending patents. According to MrSpeakers, “V-Planar technology addresses nonlinear driver motion by more deeply creasing the diaphragm to increase compliance. Much as pleats allow an accordion to expand and contract without stretching the fabric, the creases in the driver ‘open’ slightly during larger excursions…the resultant peaks and troughs are deep enough to maintain more of their physical structure even after the driver has been tensioned.” Increasing a planar driver’s compliance also improves its ability to accelerate rapidly in a linear fashion. The Ether C is slightly less sensitive than the open-backed Ether at 92dB instead of 96dB. But because of its low impedance of only 23 ohms, even lower-output portable players such as the Astell&Kern AK Jr or the Sony NW ZX-100 should be able to drive the Ether C easily. The Ether C (394 grams/13.9 oz.) also weighs slightly more than the Ether (375 grams/13.3 oz.). The Ether C’s enclosure is similar in size and composition to the Ether, but instead of an open-back earpiece protected by a honeycomb lattice, the Ether C’s enclosure has a carbon-fiber cap that is very well damped against sympathetic resonances. The Ether C comes standard with MrSpeakers’ DUM (distinctly un-magical) interchangeable cable, which can be ordered with either a single-ended ¼" stereo or balanced XLR connection. The Ether C is fairly lightweight due in large part to its headband design, which uses a Nitinol “memory metal” frame combined with an adjustable leather band. The adjustable leather band has two set-screws (one for each side). Once you find the ideal position you can lock the band in place, so the next time you put on the Ether Cs they will fit perfectly. The side-pressure exerted by the metal headband frame is firm yet not uncomfortable, making for a good seal with enough isolation to prevent anyone nearby from hearing anything, as long as he is more than a foot away from you and you’re not playing at deafening levels. The Ether C’s earpads are made of well-damped “lamb leather,” and are designed to completely encapsulate your ears to form a tight seal. Unlike some earphones, such as the Audeze LCD-2, which require trial and error to get right, the Ether C fit perfectly from the onset without fiddling. The Ether C’s two-point, gimbaled, earpiece-attachment scheme allows more than enough range of motion for the headphones to fit quite well but does not permit them to fold flat, which would require less storage space. 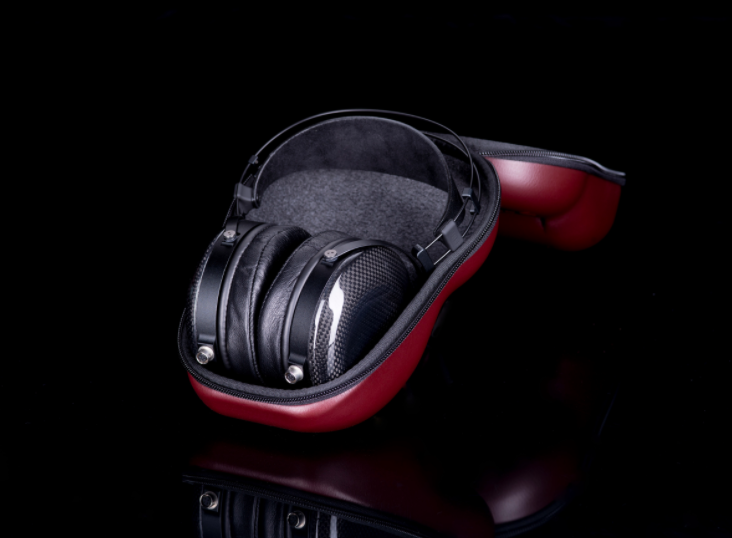 The early-production Ether headphones do fold flat, but the design was changed because the Ether’s gimbal screws could scratch the headphone cup enclosure. Since it’s more likely that you will want to travel with the Ether C headphones, this change may not be for the better. The Ether C comes in a supplied hardshell case that is rather large (about the size of a Nerf football) but does a good job of protecting the ’phones from damage during travel. Because the Ether C’s cable is interchangeable I was able to use MrSpeakers DUM cables with both single-ended and balanced connections, as well as Moon Audio’s Silver Dragon cable with both terminations. The DUM cable was more flexible and less microphonic than the Moon Audio cable, but the Moon Audio cable was lighter weight and slightly more revealing sonically. As noted, I found the Ether C was an easy headphone to drive, even with less beefy portable players. The Astell&Kern AK Jr had no problems pushing it to satisfying levels at around 45 on the AK’s 0–75 volume scale. The Sony NW-ZX100HN needed a setting of only 16 on its 0–30 scale to play loudly. Unlike some earphones, such as the Sennheiser HD 700, which benefit from using a balanced connection, I found the Ether C did not improve sonically when I used the balanced headphone connection on the Mytek Brooklyn or the Auralic Gemini 2000.